FORUM HOUR ADVENT SERIES: Waiting for Jesus. . . . for whom, exactly, are we waiting? 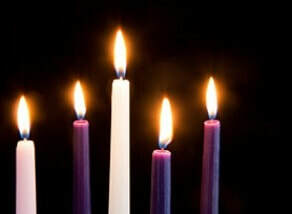 Advent begins a new Church year, as well as a season of waiting and preparation for the great feast of the Incarnation. As we are prepare to celebrate our Lord’s birth once again, Advent presents us with an opportunity to pause and reflect on who we believe Jesus to be, how we are tending our relationship with Him, and how we see evidence of His coming into the world in the here and now. Drawing upon Scripture, the Creeds of the Church, Church History, tradition, and theology, the Rev. Randy Alexander and the Rev. Rachel Rickenbaker will lead a three-week series (Dec 3, 10, 17) looking at the identity of Jesus Christ during Sunday Forum Hours in the Parish Hall at Zabriskie Chapel.